a solitary airplane stands in the desert. Nothing seems to be happening. Hot air, shimmering like a mirage, is the only perceivable sign of the passage of time. 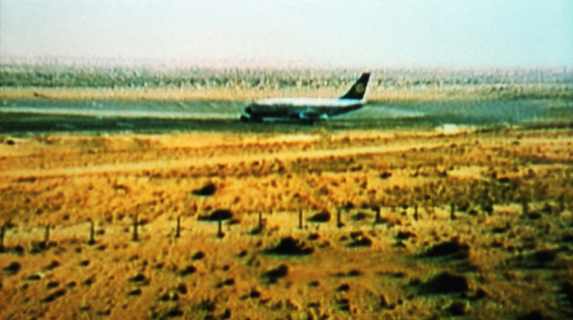 The „film“ shows a hijacked airplane, the „Landshut“, in October 1977 in Dubai where it was waiting for 48 hours with 86 hostages on board before it flew to Mogadishu. The 30' film sequence was digitally produced from a one still picture.